The Popmoney® personal payment service lets you send, receive or request money from friends, family or just about anyone with an email address or mobile number. Popmoney is a part of FMB’s online bill pay service and lets you move money from your bank account to theirs safely and securely, with ease. And since it’s available through our online bill pay service you don’t need to sign up for anything new to get started using it today. To get started log into your FMB Online Banking, click on the “Pay Bills” tab and click on the “Popmoney” link. 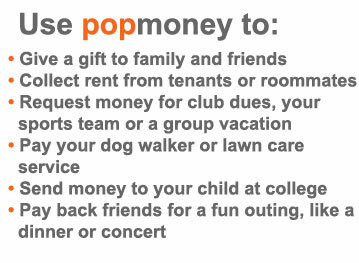 Try it today and you’ll see that Popmoney really is the easiest way to pay just about anyone. With features like eGreetings, request money, and payment scheduling we have made it as easy as we can for you to give and get money from just about anyone. Not enrolled in our Online Banking? No problem, enroll here.